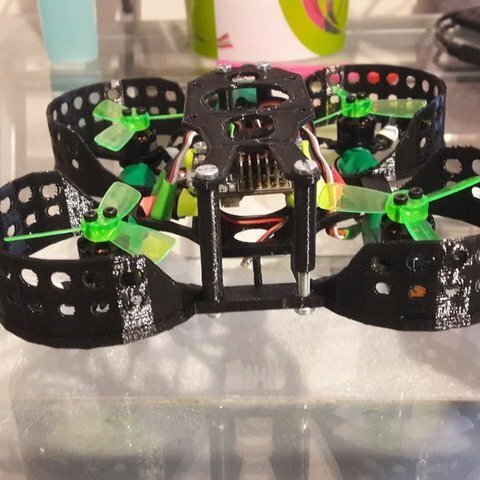 My first design for a brushless micro quadcopter. This design is not superlight but it can take some hits. Keep in mind it is no tank. Using holes in your ducts(propguards) does reduce weight and wind resistance while keeping your props and motors save. I crashed some frames, but my components never took damage. 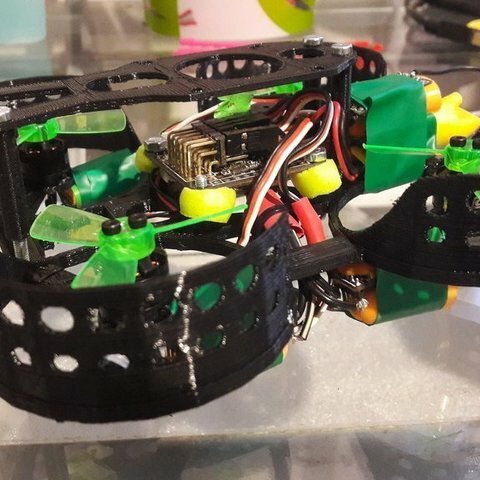 I flew it using a 850mah 3S Lipo, wich might be a bit heavy for this setup. I would recommend around 600mah with at least 45C at 3S. The 2S felt a bit like a brushed copter. As you can see in the motors display of the posted video, they max out very often at even quite chilledflight style. I would not recommend it for acro. But for a bit of cruising around, its still fun even at only 2S. And motors come down quite cold. But i guess you can use ohter props for this combo to be a rocket on 2S either. It does fly with an old NAZE32 for the moment. Will be replaced with an F4 board with OSD soon. The DYS 1104 7000KV motors work great as soon as you found the right settings for your filters. Otherwise they will burn your frame. Or themselfes. The filters will be quite a bit off to the standart settings. Yaw axis was worst. I had to reduce gyro lpf on yaw to 60hz to get a clean gyro line. This may have to do with the vibrations coming from the frame itself. The motor had most vibration around 150Hz, so i set notch 1 to 120-160hz. Dynamic filtering may do a great job, but i cant test it on this old F1 board. When powering your quad from 3S, you can feel the power! Just check the motor temperatures. It should fit a runcam split. I just dont have one to test it. If you have some flexible filament you may print the tpu motor mounts to reduce vibrations on your frame. For me this worked quite good. You may also try to print the short standoffs using tpu. I did not test it, but this should also reduce vibrations. For now i mounted my board onto slices of "oropax" earplugs. This works quite well. The camclip could also work well with some kinds of tpu. Update 01: I have added more rigid and better fitting standoffs. Update 02: Added a adapter plate for 16x16mm and 20x20mm esc/fc boards. I recommend metal screws for the first time using the screw holes. Afterwards you may use abs or anything like that.